Twitter is a powerful platform in today’s online social community. Professionals use Twitter to share quick updates and connect individually with followers and personal users tweet to have a voice. But what if you’re not an expert at Twitter, like me? Though I’ve had an account for a few years, I’ve yet to reach double digits in my number of tweets. Mostly, I use Twitter to keep up with current events and find articles from sites I find interesting, like Cosmopolitan and National Geographic. However, as I’ve started to use Twitter more for this course and for my job as a Social Media Ambassador with Pitt’s Office of Admissions and Financial Aid, I’m interested in learning how to become an expert tweeter. How do you maximize the 140 character limit? How do you make your tweets favorite-worthy or retweet-able? What makes a tweet stand out among the endless scroll of Twitter? Here’s what I found. First up: how do you utilize the 140 character tweet limit? You DON’T use all of the characters. According to a Q & A conducted by readwrite, the most readable tweets are short and sweet, adding up to about 100 to 120 characters. Tweets that are maxed out often get skimmed over when users are scrolling through their feeds because they’re too tiring to read amongst the thousands of others. Also, by not using the maximum characters, others can add a few words of their own when retweeting. In the same realm of links, tweets with photos are much more noticeable than those without and consequently more likely to be favorited or retweeted. I mentioned before that one reason I use Twitter, despite my lack of tweeting, is to find interesting articles. The site whose tweets I read most often is Cosmopolitan. Looking at the magazine’s profile, it is a prime example of a Twitter expert. Yes, it’s one the most successful magazines worldwide, but by sticking to the basic elements I listed above, Cosmo makes its tweets sticky. The magazine almost exclusively includes a photo in every tweet and always includes a link or an @ mention too. 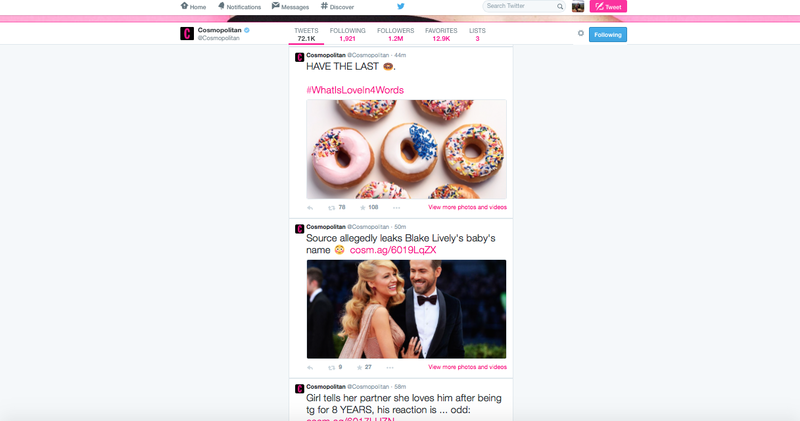 Furthermore, Cosmo makes a point to retweet not only other businesses and celebrities but its readers as well. Check out the photo below of Cosmopolitan’s Twitter feed or click here to view its profile: https://twitter.com/Cosmopolitan. Quick aside about @ mentions: starting a tweet with @username is a reply, but placing @username anywhere else in a tweet is a mention. Your followers will not see a tweet when you start it with @username, unless they go to that user’s profile. A common trick is to put a period before the @ mention (i.e. “. @username”), so that user and all of your followers see it on their feed. 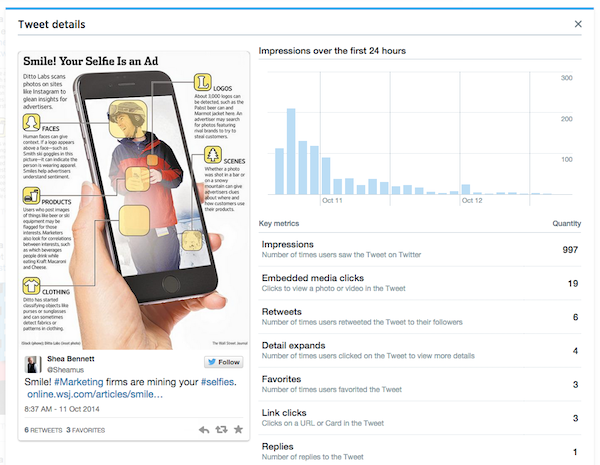 There are tons of easy tricks to make your tweets more favorite-worthy and retweet-able. It just takes a little time and planning to become Twitterrific. Bennett, Shea. “10 Secret #Twitter Tips, Tricks and Hacks (That You Probably Don’t Know).” SocialTimes. Adweek Network, 13 Oct. 2013. Web. 10 Feb. 2015. <http://www.adweek.com/socialtimes/secret-twitter-tips-hacks-tricks/502273&gt;. Copeland, Dave. 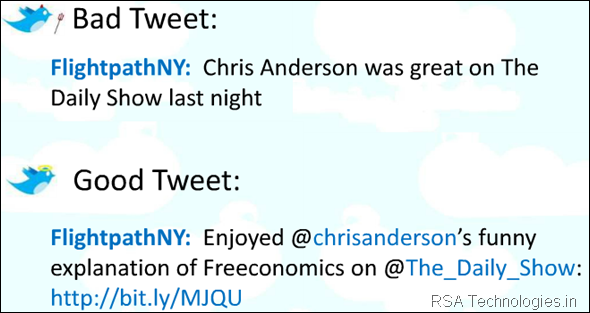 “How To Write Readable – And Retweetable – Tweets.” Readwrite. Wearable World Inc., 09 Mar. 2012. Web. 10 Feb. 2015. <http://readwrite.com/2012/03/08/how_to_write_readable_-_and_retweetable_-_tweets&gt;. Rakesh. “Problogger Guide to Increase Twitter Followers.” BinaryNote. N.p., 09 Feb. 2015. Web. 10 Feb. 2015. <http://www.binarynote.com/problogger-guide-to-increase-twitter-followers.html&gt;. ← Yep, Its More LinkedIn Tips! Hooray! I found your post really helpful. I’ve always wondered why some tweets seem to get more attention and feedback than others, and this explained why. I’ve started managing the Twitter account for my internship and your tips about including links and hashtags are things that I can do to get more attention and conversations started. I also found it really interesting that the time of day you Tweet can influence how popular that Tweet becomes. Like you said, including links can make Tweets more popular, but I know that some people find links annoying. I wonder if this influences the popularity of some posts? I feel like a lot of these suggestions can be very easily applied to crafting a business persona through twitter. For example, one can track potential business partners/clients/employers to research more information before potential meetings about their business needs. One can also tweet links and use hashtags to the get the attention of possible business partners. I think the main thing to pay attention to is the type of information one shares so that it is relevant to the audiences they are trying to reach. I feel like a lot of these tips were super helpful. Like you, I’ve had a Twitter for years but never really paid that much attention to it except for reading articles. Now that I have Longform, I really don’t check it at all. Maybe once a week or whenever I publish something I’ll make a post for it. It was really interesting to read about what lengths of tweets get noticed and your section on @mentions. I’ve noticed more and more businesses are using this method. It just makes me wonder a little more how individuals can do this without coming off as weird or like a stalker. Unless, it works the same when you are @mentioning friends and family. This would certainly be something to look into if you plan on maxing out your Twttier uses. I have trouble with the 140 characters as well. Usually I come up with a tweet and it’ll be 20 characters over the limit. However, this has presented a challenge in editing my content for precision. The difficulty of fitting complex thoughts into 140 characters has even helped me practice conciseness in my writing. It’s helped me cut out unnecessary connectors and put together sentences that get right to the point. As for getting users to favorite or RT, I’ve found that if you tweet passionately about your interests then like-minded people will find that regardless. I’m constantly on Twitter and will often connect with random people who have found my tweets just by searching a keyword. Hashtags certain help you stand out among all the content, but I don’t think you have to pander to followers with mentions and links. Interjecting a unique personality also helps tweets stand out and followers hearing issues from a new angle. I really enjoyed this post because everyone pushes using all of the characters in a tweet– and I’ve been very adamant about the fact that this may not be the best route to take! No one wants to read through 3 lines of a single tweet. In terms of the hashtag, I definitely understand it’s use, but sometimes people can go overboard with it. Reading a tweet is extremely difficult if every other word has a # in front of it.